my Tennant suit arrived a couple of weeks ago and have been holding out on writing a review until i took it out for a test run, well i have been wearing it everywhere, honestly im running out of excuses to wear it. It get compliments any time i wear it. the half belt design and four button front really set it apart, one of my friends said it looked very military almost like i was going into battle. 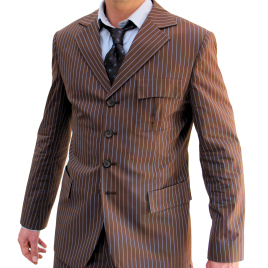 Magnoli really went above and beyond AGAIN with customer service, i tortured him on what fabric to get the suit made with and we eventually settled on a dark brown cotton, and its so soft and has a nice crumbled look after a wash that really completes the tennant look, Magnoli also got my other specifications incoporated into the suit. Is there anything Magnoli can't do? As far as the fit this suit fits like a glove, i have always had problems with off the shelf suits and the fit, a regular is usually to short and a long is usually too long but the Tennant suit fits brilliantly. I was so worried about my measurements being incorrect even to the point where i was emailing Magnoli days before the suit was finished seeing if i could get it altered, once again Magnoli came through and it all worked out perfectly. Im getting ready to order my next suit in a different colour from Magnoli im gonna build a small collection of them, he's got a customer for life here.